In 1896, Delhi Ambala Company was entrusted with the responsibility of constructing this train route. The journey of the Kalka-Shimla train started in the year 1903 during British Raj. At the time of British Raj Shimla was a summer capital of India. The train is still running on this two-foot six-inch narrow gauge lane.There are 103 tunnels and 869 bridges in Kalka-Shimla train route. This route leads to 919 curves, of which the train turns at an angle of 48 degrees at the sharpest turn. All the tunnels are built between 1900 and 1903 and the longest tunnel is a Barog tunnel, which is almost 1 km long. After leaving the Kalka (Haryana) railway station at an elevation of 656 meters above sea level, the Kalka Shimla train passes through the winding path of the Shivalik hills and goes to Shimla, located 2,076 meters above sea level. When the British started work on this railway track, due to a big mountain in Barog, developers facing the problems to move forward. And therefore The British decided to leave this train route development in the middle. Because of this, Colonel Barog, who is looking at the track’s work, committed suicide. Today the name of the Barog Station has been named after him. 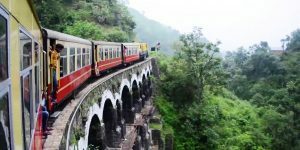 You can get an opportunity to watch the early mountain range of Himachal, with a speed of 15 to 20 kilometers per hour.Kalka-Shimla Train is briefly called KSR (Kalka Shimla Rail). 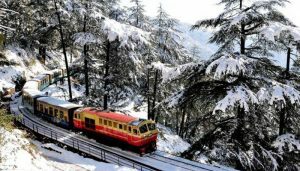 Kalka To Shimla Toy Train is a special attraction for tourists. Shimla Railway Station is very beautiful and clean. The station itself looks like a railway museum. A lot of information about the Kalka Shimla Rail is available in the pictures here. There are good waiting rooms for second class and first class passengers. The station also has a cottage home. Advance bookings can also be done for staying here. About one and a half thousand passengers travel in the normal season on the Kalka-Shimla Train, while this figure doubles in the peak season. If you start your journey from Delhi by Himalayan Queen, then you get a train from Kalka to Shimla in the afternoon. If you have reached Kalka after 12.30 pm, then stay in the vicinity of the Kalka railway station and travel further from Kalka to Shimla next morning by this toy train. If you are late then stay at Kalka & start your journey towards Shimla in the next morning. Take a lunch after arrival at Shimla Railway Station. Because you need to walk longer from there. In the peak season, you have to do advance booking almost a month before. During April-May-June prefer morning train schedules. Keep your food and water bottle with you. You will get only a cup of tea at Kalka Railway Station. Avoid selfies during the train journey.